Retirement did not cause Mary Elizabeth Sweeney to slow down, or to lose any of the attention to detail and personal touch that made her such a towering asset to the Archdiocese of Baltimore. The life of Ms. Sweeney, known as Betty, was celebrated at a Mass of Christian burial at Villa Assumpta in Baltimore March 27. Before her death at Stella Maris Hospice March 24, at age 86, she had resided at Mercy Ridge. 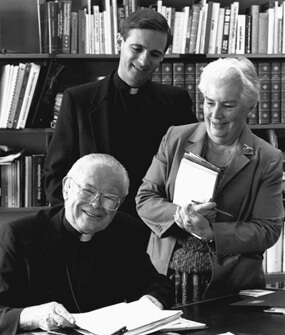 From 1962 to 1994, Ms. Sweeney was administrative assistant to Cardinal Lawrence Shehan, Archbishop Borders and Cardinal William H. Keeler. Cardinal Keeler presided at her funeral Mass, and Archbishop Borders gave the commendation. Bishop Newman, also retired, was the principal celebrant. The concelebrants included Bishop Mitchell T. Rozanski, Bishop Denis J. Madden and approximately two dozen priests. Villa Assumpta, the retirement community of the School Sisters of Notre Dame, was full with its residents, a busload of friends from Mercy Ridge and members of Ms. Sweeney’s extended family. Bishop Newman noted Ms. Sweeney’s “dignity, competency and loyalty.” Her intellect and personality were also prized at the Catholic Center. He later explained that his sister, the late School Sister of Notre Dame Mary Dolora, and Ms. Sweeney were good friends as young women, when their families were growing up in the Church of the Blessed Sacrament in north Baltimore. According to her niece, Ms. Sweeney was a School Sister from 1942 to 1951, when the graduate of Towson Catholic High School turned to secretarial work in Baltimore. She was near 60 when she finally completed her undergraduate degree from the College of Notre Dame of Maryland. “She was a really smart woman when that was not a popular thing to be,” said M. Rosewin Sweeney, a niece. At the Catholic Center, Ms. Sweeney was a combination gatekeeper and sounding board. In addition to scheduling appointments and typing homilies and statements, she fielded hate mail after Cardinal Shehan issued his statement on racial justice in 1963. She assisted him during the Second Vatican Council and didn’t slow down while assisting his successors. Her service to the church was recognized with a Medal of the Holy Cross, and in 1994, The Catholic Review reported that Ms. Sweeney became what was believed to be the first in the U.S. to be named Dame Commander with the Star of the Order of St. Gregory the Great. After retirement, Ms. Sweeney helped the archdiocese prepare for the 1995 visit of Pope John Paul II. A Villa Assumpta volunteer and world traveler, she took many trips to Ireland and Italy, and also visited Australia, Japan, New Zealand and Tahiti. Her survivors include brothers John J. Sweeney, Jr. and William B. Sweeney, and a sister, Patricia S. Wolfe. The Robert F. Sweeney District Court Building in Annapolis is named for a late brother who served as a chief judge on the district court. The oldest of seven children, she had more than 20 nieces and nephews, even more of what she called “grand-nieces” and “grand-nephews,” and gave all the same care she did various bishops of Baltimore. “One of my nephews was writing an important essay that was part of the college admissions process,” said her niece, M. Rosewin Sweeney. “His English teacher read it, his college counselor read it, his parents read it, and both of them are lawyers. George Matysek contributed to this article.